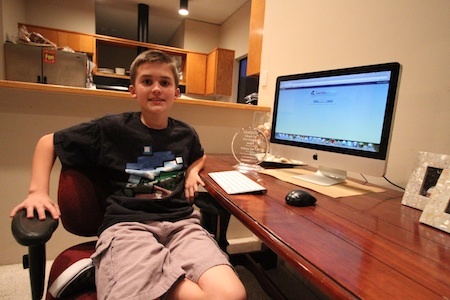 As it is for most kids, school isn’t always fun for Top of the World fifth-grader Ethan Ghere. There are days when he’s just bored, and that can lead to either trouble or discovery. On this particular day, trouble transmuted into treasure. “Well, I was in the principal’s office one day because a little predicament happened,” explained an articulate yet somewhat shy 10-year-old Ethan. “I was being a little rambunctious in the classroom with someone else.” It was during a math lesson, and Ethan wasn’t exactly participating. The fact was Ethan had something to say. And say it he did. La Motte asked Ethan to type up his ideas. Ethan, who doesn’t see problems but prefers seeing how to make things better, typed up a bulleted list of eight thoughtful suggestions to make the program more like a computer game that accumulates points for accomplishments, building to new levels to master. La Motte read it and found himself amazed. “I looked at it and thought, ‘This is really good stuff,’” La Motte relayed Tuesday to Laguna’s school board before Ethan was presented with an award and a student-consultant’s position with the company. After reading Ethan’s suggestions, La Motte called Victor Guthrie, the district’s director of technology, and they agreed to send Ethan’s list to Pearson. Pearson’s representatives were equally impressed with Ethan’s suggestions. Five company executives, including the vice president of product management, traveled from various parts of the country to meet with the young prodigy. As it turned out, Ethan ran the meeting. Not one to think anything is “wrong,” Ethan’s first point was that the program’s pop-up tutorial button needed its etiquette tweaked. “When you get a question right,” Ethan explained, “sometimes you get a tutorial and that kind of makes my blood boil.” Nobody likes to be corrected when they’re right, right? Ethan suggested an ever-present and always polite tutorial button. “If you get many of the same type of problems wrong (repeatedly after eight times), it will ask you, ‘Would you like a tutorial?’ Then you would click ‘yes’ or ‘no,’” Ethan wrote in his list. At the end of the presentation at the school board, Ethan, standing silently but never short on words, spoke up again. “May I say something now?” he asked politely, and thanked an extended-family contingent that even included his great grandmothers from Leisure World as he nervously played with a button on his neatly pressed shirt. As its first recipient, Ethan was asked to name the award, which he dubbed “Ghere Up for Success,” playing on his last name. His youngest brother, 7-year-old Carter who loves Monopoly, later suggested that Ethan sell the round, clear Lucite plaque, according to Campbell, saying, “I bet you could get $200 for it.” Ethan passed. “Why would I want to do that?,” Ethan responded. “It’s priceless.” The plaque stays at home for safe-keeping but Ethan drew a detailed picture of it for his classmates. Trey Thompson, the Pearson account representative who presented the plaque to Ethan, said Ethan inspired the company to follow through with an annual contest asking students for their ideas on improving products. As for Ethan, his work is “ghere”-ing him up for success. “He will sit on our product-management team,” said Thompson, “and decide if it’s a thumbs-up or a thumbs-down for that product.” An update with one or more of Ethan’s suggestions imbedded in the program is expected in April or early May. The gig, said Thompson, won’t pay off just now. As for Ethan’s future, however, he might need to start wearing shades. Thank you for this story. It warms my heart to think about the meeting with Ethan, Mr. LaMotte and the executives at Pearson.